New technology within the development of Fire Extinguishers. 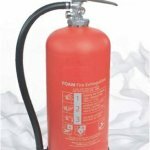 FFM are proud to offer the new range of Composite Fire Extinguishers. No annual servicing costs and a 20 year lifespan these extinguishers are lighter and easier to use. The Foam fire extinguisher incorporates the latest in Pulse Technology, allowing it to be used on live electrical equipment. British made using state-of-the-art clean manufacturing processes, the patented extinguishers employ technology pioneered by the motor racing, defence, aircraft and aerospace industries and on average our clients benefit from an average cost saving of 47%.